The Australian government announced on 1st March 2019, that the Australian citizens or permanent migrants can now apply for their parents to stay for a longer period with them in Australia compared to a visitor visa. The subclass ‘870 Sponsored Parent (Temporary) visa will help the parents ‘reunite’ with their children and grandchildren in Australia. 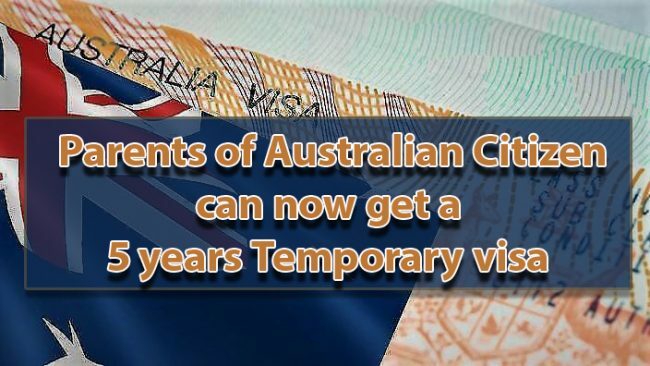 With this temporary visa, the parents can now stay for a period of five years without leaving Australia. However, after completing five years, the parent must be outside of Australia for at least 90 days before reapplying for the same visa. The government has set a cap of 15,000 visas to be granted in each program year (from 1 July to 30 June). The applications for this visa can be lodged from 17th April 2019. The fee for a visa of up to 3 years is AUD $5,000, and AUD $10,000 (Australian dollars) for a visa of up to five years’ duration. The sponsorship application fee is $420. No specific processing times have been made available by the Home Affairs department, but several factors have been told to affect processing including the number of applications lodged and whether an applicant provides all required information with their application. · share authorized information with the visa applicant. It has to be noted that the visa does not entitle any ‘working rights’ to the parents who will come to Australia.